L'assemblage, or blending, requires not only sharp tasting skills but a familiarity with how the wine from each of our parcels tends to evolve. Each has characteristics that must be taken into account. The “recipes” for our cuvées exist only in the memory and palate of our family. Thus, in December we sample base wines recently fermented, along with those reserved from preceding harvests, in order to determine their qualities and decide which blends will best express their personalities. At this moment we determine how much of each blend will be produced for that year. If the harvest is exceptional, a portion of that year’s wine will be set aside for a vintage. 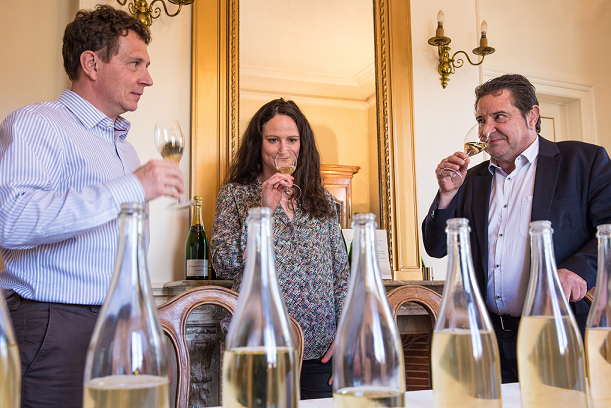 It’s finally time to combine the particularities and proportions that produce the harmony and complexity our Champagnes are known for. Bottling (le tirage) follows blending. This is when yeast and sugar are added to provoke a second alcoholic fermentation.